It was the perfect setting for this handsome young couple; Lucy and Travis. With their simple and rustic theme, this relaxed pair evidently had a fabulous day, all captured with the magic of Brooke Baker. Lucy chose the beautiful Maggie Sottero gown; Mirian and looked every bit of elegant in this lace sheath gown. "I loved the Mirian, the pattern of the lace which had ferns, trees and daisies were all very meaningful to me and it helped that the dress shape suited me perfectly too!" The cowboy boot trend that we have seen this season, has definitely brought the popular rustic theme to new levels. But we absolutely love Lucy's boots; ordered from Modcloth.com, she personally added this painstakingly detailed design... its very clear that this girl has artistic talent! "We wanted a relaxed, outdoorsy, fun day that centered around the beautiful venue and catching up with our guests. We organised it so we did minimal set up, which was done instead by our amazing florist; Tami, and Les and the team from Woodside! We also chose to do first look and bridal party photos before the ceremony so we could mingle with our guests afterwards." 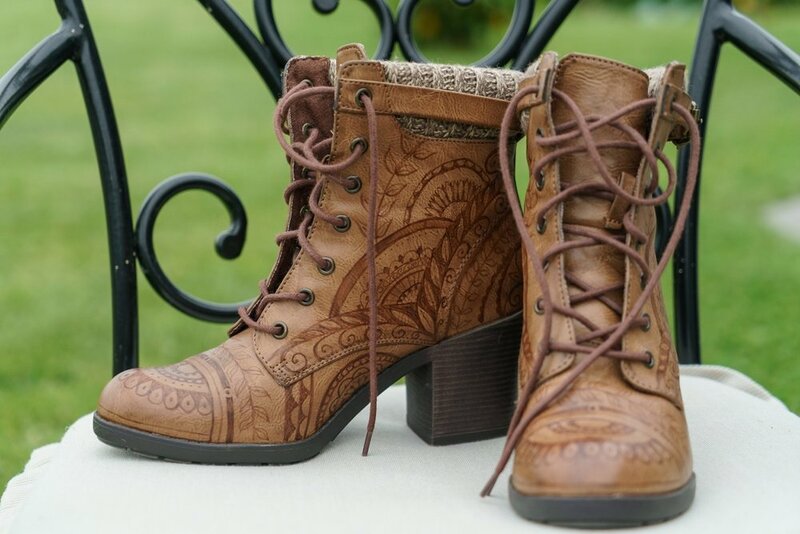 Accessories: Boots - Modcloth.com, but adorned with Lucy's own design!